An optical flame detector reacts to radiations emitted from any flame type. A flame detector sensor is designed to quickly alert (a few tens of milliseconds) of any fire outbreak through digital (RS485 communication, Modbus or Hart), analog (4-20 mA), or relay signals. 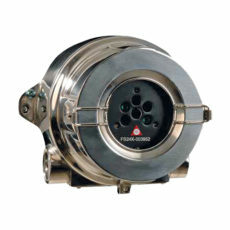 An optical flame detector is composed by ultraviolet (UV) and infrared (IR) sensors. The most efficient flame detectors usually feature several sensors (UV, UV/IR, IR3 or IR4). 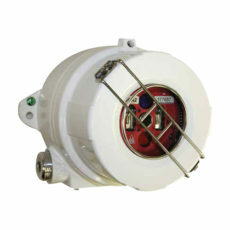 Most of our optical flame detectors are SIL2 approved. They provide a high performance level and their mean time between failures (MTBF) is higher than 17 years. An optical flame detection system is well suited for highly hazardous industrial areas like refineries, gas pipelines & pumping stations, storage depots (solvents, alcohols, paints), offshore platforms, printing plants and also every ATEX classified areas (explosive atmosphere). These fire-outbreak monitoring units are particularly efficient for hydrocarbon - combustible gas - (fuel, gasoline, jet fuel), methane, LPG, hydrogen, polypropylene fire detection as well as paper fire in printing plants for example.
. UV flame detector – made with a UV sensitive sensor. It generates an output signal based on the radiation and compares it to an accurately calculated reference.
. IR flame detector – composed of an IR sensor sensitive to CO2 exhausted by fire.
. UV IR flame detector – made up of an UV sensitive sensor combined to an IR sensor for the detection of hydrocarbons, hydrogen and metal flames with a high-speed response time (<150 msec). It requires a simultaneous response of both sensitive units.
. IR3 flame detector – three pyro-electric sensors detect the IR radiations related to different emission peaks. 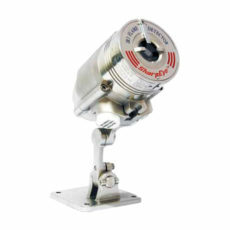 The IR3 sensor for hydrocarbons flame monitoring is immune to sunray.
. IR4 flame detector – a combination of 4 infrared sensors to detect hydrocarbons and hydrogen flames 5 to 65 meters away. ATEX and SIL 2 approved high performance flame detector (MTBF > 17 years). Different versions adapted to each fire type.